Flying a kite on the roof of Ahmedabad's Jama Masjid mosque. All photos by Meena Kadri. I thought it apt therefore, to share something about this amazing festival, known as Uttarayan, which takes place on 14th and 15th January every year. The Indian state of Gujarat celebrates some 200 festivals a year, but Uttarayan is arguably the biggest, and is now a 2-day public holiday. It marks the end of winter, and the return of summer and the impending harvest. Everyone takes part, making kites at home and flying them from the rooftops. The streets and markets in Ahmedabad are flooded with kite-sellers and equipment for kite-making in the days leading up to the festival. 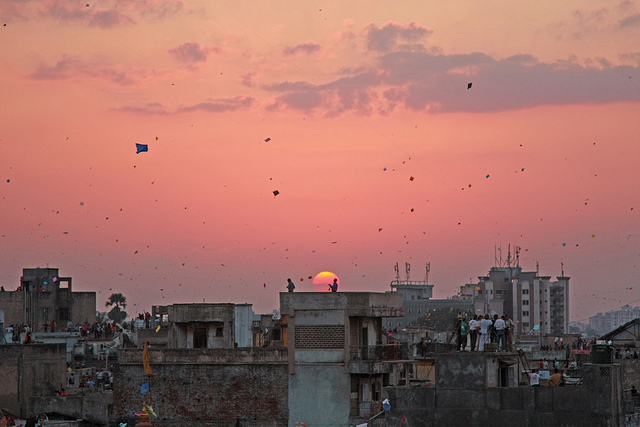 One of the most famous markets for materials and kites is Patang Bazaar in Ahmedabad. Flying a kite on the roof of the kite market. Symbolically, the festival represents the awakening of the Gods from their winter sleep. It was first introduced by Persian Muslims, and was enthusiastically embraced by the kings and queens of India who made it a royal sport. But gradually over the centuries, it became popular with ordinary citizens, and today everyone, regardless of faith or background, is welcome to join in the fun. In 1989, the first International Kite Festival was held in Ahmedabad, which today attracts kite flyers from all over the world. Sigh - I wish I could be there! Enjoy these wonderful images of the festivities by Meena Kadri, and check out more of her gorgeous images on her Flikr page. You may also like this little film on kite-making from the National Institute of Design in Ahmedabad. Manja-maker - these workers pop up all over Ahmedabad during kite season. The kite string is coated in a mix of powdered glass and dye - manja - to enable the kite flyer to cut down opponents' kites! Kite flying goes on well into the night! All images copyright of Meena Kadri, and are shared here under the Creative Commons License.